Veggie Haggis?! Not tonight...get over to Brouwer's for their Great Scots! night for good Scottish beers and some real Haggis. Looking for some AC tonight to get out of the heat? Head on over to Brouwer’s Cafe for their “Great Scots!” night. A night of Scottish Ales featuring Belhaven. Pillagers Pub will be hosting the first brewers night for upcoming Breakaway Brewing, new home of Skip Madsen formerly of Waterstreet Brewing. Stop by Thursday night after 6:00pm for the first keg of his Breakaway IPA. Hockey Goalie Skip is known for his big…… Hoppy Beers! Come and talk with Skip about his new venture and taste his great beer (wear your hockey regalia). Pillagers Pub is at 8551 Greenwood Ave N #5 Seattle WA 98103. See you there! Pyramid Breweries is pleased to announce yet another winning brew to our line up with the introduction of our new fall seasonal, Juggernaut Red Ale. Brimming with unstoppable taste, Juggernaut is an irresistible American red ale featuring delectable caramel malts, delicious hops and an unquenchable spirit. Juggernaut will be available during August and September in bottles and on draft. For those of you looking for a sneak taste prior to Juggernaut’s availability in the market, you will find it now available on draft at all of our Pyramid Alehouse locations. Looking to save some money on beer these days? I know I am. The question probably is, who isn’t? Seattlest is running a series of “Happy Beer Hour” posts to focus on happy hours around town that offer deals on craft beer. Written by guest writer Paul Orchard, of NW Beer Guide fame, the first part in the series focuses on deals at Brouwer’s, Rock Bottom, and the Maple Leaf Grill. 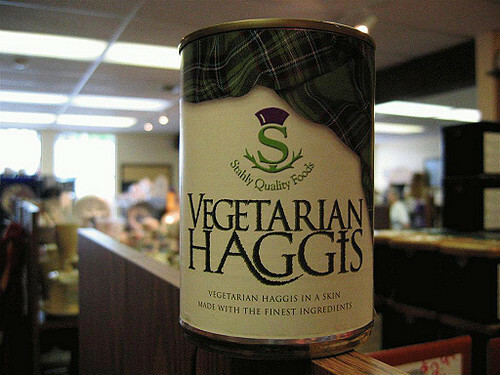 Thanks to selva on Flickr for the lovely picture of Veggie Haggis. I didn’t know Skip had left Water Street. What does this mean for them? I know they had recent financial problems…hope they can survive.